What is the last thing you want to do after you have finished your newly remodeled bathroom? How about cracking a ceramic tile while trying to hang your towel rod. It seems that tiles keep getting harder and harder, but the bits just can't seem to keep up. Bosch aims to solve these problems with their new glass and tile bits that boast a unique geometry that allows them to drill better, faster, and last longer then traditional glass bits. Made of tungsten carbide, the precision diamond ground point eliminates walking, and allows for smooth cutting. 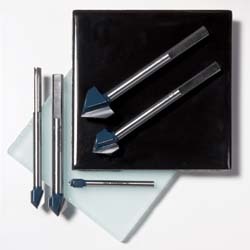 Best suited for glass, ceramic walls, and ceramic floors; the new bits should be a welcomed addition to professionals and DIYers tool boxes.